With the bitter cold of the last week, I am having a hard time thinking spring will eventually arrive. I know it is only January 3, and spring isn't due until March, but boy do I need it. Yesterday we were well below zero degrees Farenheit when I got up, and they are saying we'll get some snow tomorrow. Depending on how close to the shore the storm tracks, we could get a good dumping. And then those weather people talk about Saturday. Sounds like it will never get to zero degrees F all day, and could be -20 that night. (That means we will be at about -17 degrees C during the day and around -29 degrees C at night). I know lots of you are also having similar winter weather adventures. And spring is a seasonal adventure that lies ahead and may have many of us in the deep freeze wishing it wasn't so far in the future. My page started with this tag I found in a box. I did a little stenciling and sprayed the page with some ink. I painted that big sun. Then I added some of these pretty Victorian stickers that I recently won at Tag Tuesday as well as a few stickers from my stash. I am linking up to Art Journal Journey and this month's theme of New Year, New Adventures. I hope you decide to join in with your own adventures over at AJJ. And not sure if any of you are X Files fans, but there's a new season starting tonight. I'm excited to see what it looks like. I will say all this cold weather has turned me into an evening TV addict. Not sure that's a good thing or a bad thing, but it's what it is. Thanks for stopping by to visit my blog too. Another beautiful page, I love the bright yellow sun! Enjoy the X Files, thanks for the heads up! Oh boy that is soo cold - poorly Erika - I hope you get warmer soon. A beautiful page - I can tell you that all about it is just BEAUTIFUL - your style is amazing! Thank you for that wonderful springtime page for AJJ. I am off to visit friends - so no time for art- but I have so many ideas already for this month! Ugh. Cold as all get out here, but at least I don't have to get up early and go to work. You have my sympathies. Meanwhile, I'm wearing my fingerless mitts to type, bundled up. And the heat is working. Watching the weather is more depressing than watching the news and we can't do much about either. But your art brings a touch of spring into the day and for that I am most grateful! I can relate to these frigid temps-we were finally on the plus side this morning and the temps are improving here. still no snow to speak of-though I would rather have the moisture we need in rain and warm temps-we are known in this area for really bad ice storms-which I don't want to deal with now at our ages. so I feel for you, we retired here to Missouri to still have all 4 seasons to avoid rough winters. this very cold winter so far is not normal for this area. A new season of X-Files!? Googling.... How'd I miss that? Thanks for the tip. I loved that show -I even loved the Lone Gunmen spin-off. I'll definitely tune in. Its a fabulous page Erika. We are all thinking of spring, but know winter is not done with us for many weeks to come. Enjoy the TV shows and be safe and warm. We've been in the deep freeze here, too. It is supposed to warm a bit this weekend, but still no moisture. Even my spittle has dried up (grin). This latest entry is fabulous, Erika. YOUR stickers are far more beautiful than any I have. Nice that you used some you won, too. 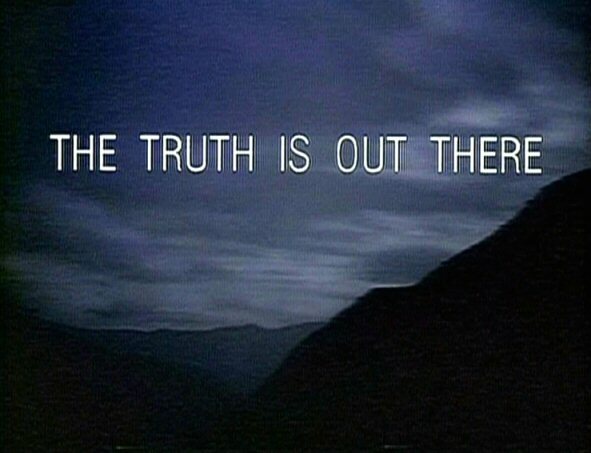 BTW, when was X-files on and where? 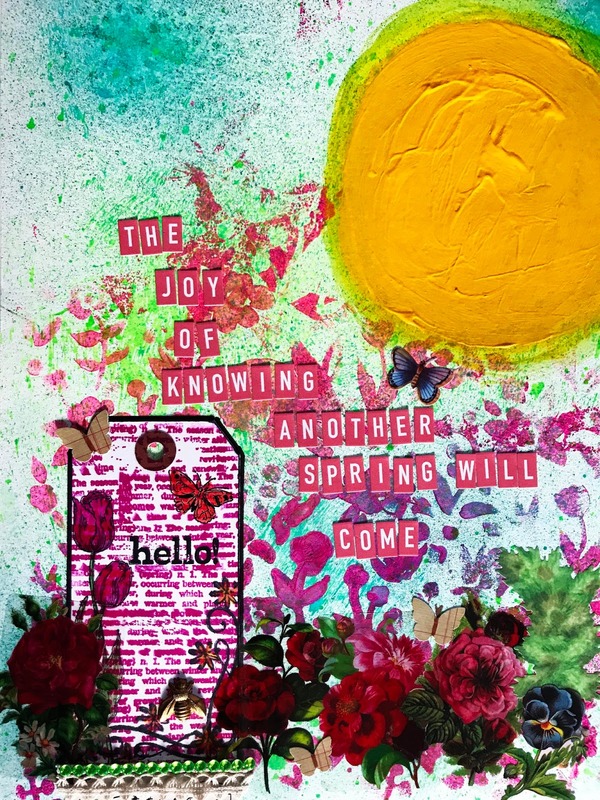 Thanks for sharing this entry at Art Journal Journey, dear host of the month! I love your page. Sunny and warm. A lot better view than the white outside my window. Beautiful page! LOVE the texture of the sun!